gegenwärtig wohnhaft in Valinhos, Bundesstadt São Paulo. 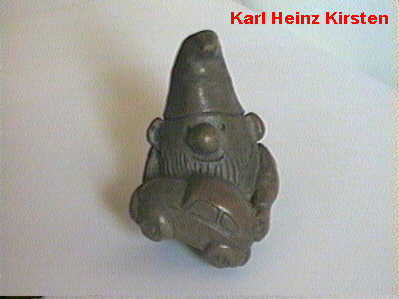 ständige beteiligung an Kunstaustellungen mit Bildhauerei, Fotografie und Karikaturen über Ökologie, u.s.w. 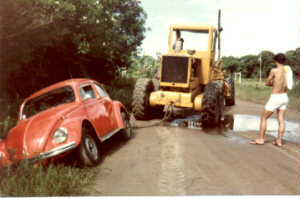 He decided to go to the beach, and headed to Bertioga, the year - 1978, the Beetle - nice and clean! The sand road was fine, but a suspicious lagoon came ahead. What to do? He had little experience in this situation and thought it could be a deep hole! Carefully he avoided the hole by passing over a nice green and "firm" road board. Suddenly - OOPS!!! 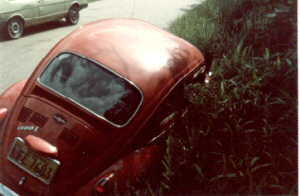 the brand new Fusca "heeled to port" and got stuck in a deep drain channel hidden by a beautiful and nice green grass!!! 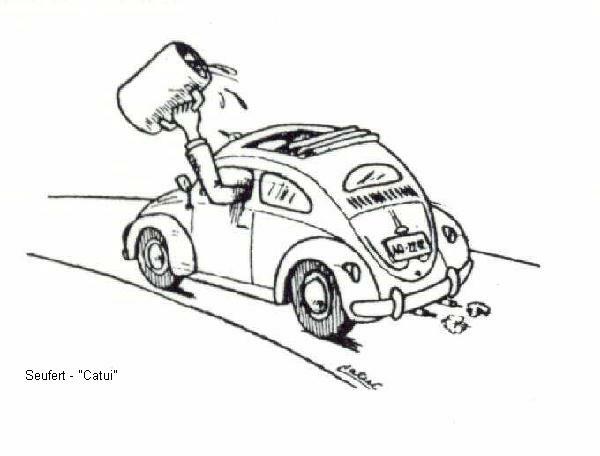 Well, one experience more, the Fusca suffered no major "injuries" and drove ahead to the planned place without any additional "surprise"! 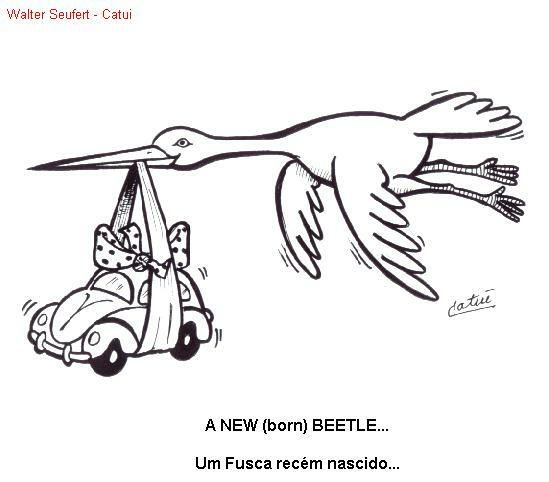 No other "Beetle-trap" was on the Fusca's way that day. Walter, alias "Catuí", is a good friend, a nice and sensible soul! We were work colleagues for many years and he was and still is always ready to help. 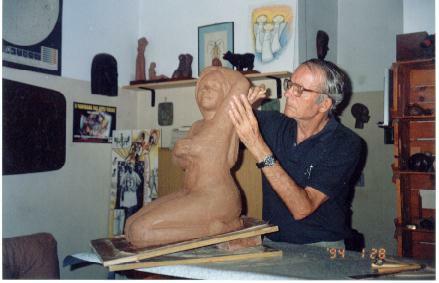 His artworks have international renown. 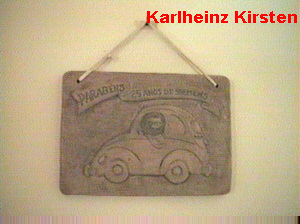 For many years those of you that use to receive my Seasons Greeting Cards already had the opportunity to know his work. Now I'm happy that he send the material to be included in the QUEST's Site, so all of you can know him too. I thank Walter, or better said, Herr Seufert, for his friendship and for the help all this years! Walter, ou melhor "Catuí", é um bom amigo, uma alma gentil e agradável. Fomos colegas de trabalho por muitos anos e ele esteve, e continua estando, sempre pronto para ajudar. Suas obras de arte tem renome internacional. Por muitos anos todos de vocês que costumam receber meus cartões de Boas Festas já tiveram a oportunidade conhecer o seu trabalho. Agora estou feliz pois ele enviou material para ser incluido na página da pesquisa; assim vocês também podem conhecê-lo. Agradeço ao Walter, melhor dito Herr Seufert, por sua amizade e pelo ajuda de todos estes anos!